Comparing Model Results with Data | What Planet Is This? One of the interesting things about the Kiehl and Trenberth 1997 paper is that it’s possible to make a simple climate model based on it. This diagram (Figure 1) repeats the paper’s classic (and somewhat overused) Fig. 7, but here I’m only using the data values from the paper’s figure. Of course, some of these values are off by a factor of two or more. It’s also obvious that the figure’s audience wasn’t meant to be other scientists; otherwise these values would include error ranges. In any case, it’s possible to get a feedback model to stabilize at these values. I have such a model using an Excel spreadsheet. One obvious restriction is that Excel doesn’t allow self-referencing cells, so I created a macro to bypass this limitation. This simple climate model allows us to play with various parameters. 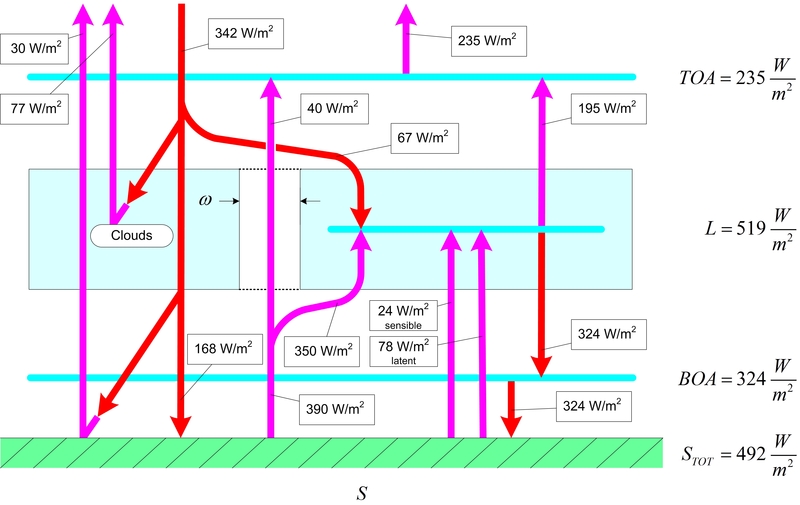 For example, to simulate increasing greenhouse gases (GHG) all we need to do is narrow the atmospheric window (shown as ω in the diagram). The atmospheric window shown here is set at about 10% (40/390). By reducing the window’s size, we have more radiation being absorbed by the atmosphere. The advantage of doing this is that we don’t have to worry about which GHG is causing the effect. We also don’t have to worry about the CO2-H2O coupling in the enhanced greenhouse effect (EGHE), because narrowing the window handles everything nicely. What happens when we narrow the atmospheric window? The surface warms, but the atmosphere warms too. In fact, the rate of atmospheric warming is greater than the rate of surface warming. I’ve played with these values and the atmosphere warms at a rate of about 130% to 160% of the surface warming. This effect is due to the physical arrangement of the feedback loop. It’s a requirement of the model. I happen to know that the atmosphere isn’t warming at this rate. The atmosphere is warming, but at a rate that is less than the surface rate. So I looked for other warming possibilities. Another way to warm the surface is to reduce the planet’s albedo–that is, make the planet darker. This causes more radiation to be absorbed by the planet which will also increase the surface temperature. The planet’s albedo is due to both clouds and surface reflectivity. From the diagram, we can calculate it at about 31% ((30+77)/342). This is roughly the planet’s albedo, although the value may be off by 10% or more. If we alter the planet’s albedo, we get similar results, but instead of a 130% to 160% range, it’s 60% to 90%. That is, the atmosphere warms at a rate of about 60% to 90% of the surface. This is more in the ball park of what we know about the current rate of atmospheric warming. There’s another way to alter the surface temperature, but that requires changing the Sun’s input. We’ve been told many times that the Sun–the solar constant–supposedly precludes that possibility. What happens to the rate of atmospheric heating, if we combine both the greenhouse effect (GHE) and the reduced albedo? It turns out that the atmosphere acts like it’s a GHE acting alone. So we have three cases: 1) GHGs acting alone; 2) reduced albedo acting alone; and 3) GHGs and reduced albedo acting together. In cases 1) and 3), we’ll get a 130% to 160% atmospheric warming rate; and in case 2) we’ll get a 60% to 90% atmospheric warming rate. So let’s try some actual data. 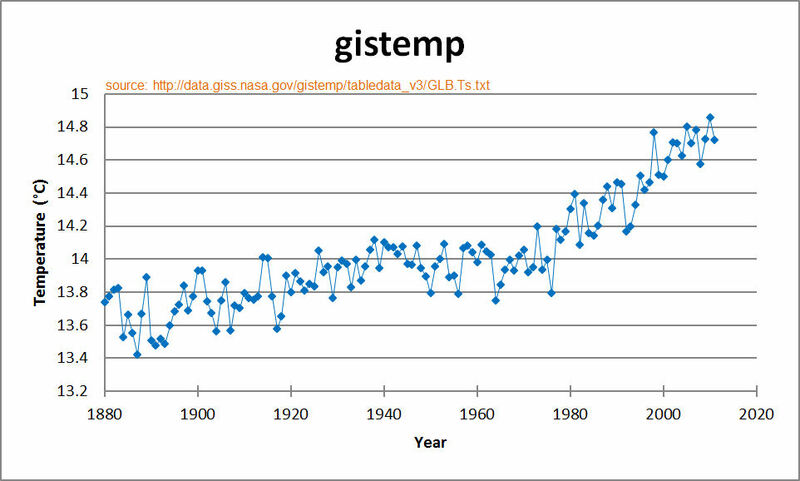 My first choice is the temperature record from GISS. Although there are some problems with using this record, it has a couple of things going for it–it’s one of the standards, and it’s easy to find their data. I show their surface temperature record in Figure 2. The curve in Figure 3 should look the same as Figure 2. That’s because I’m using the same data but with 14 added to each value. 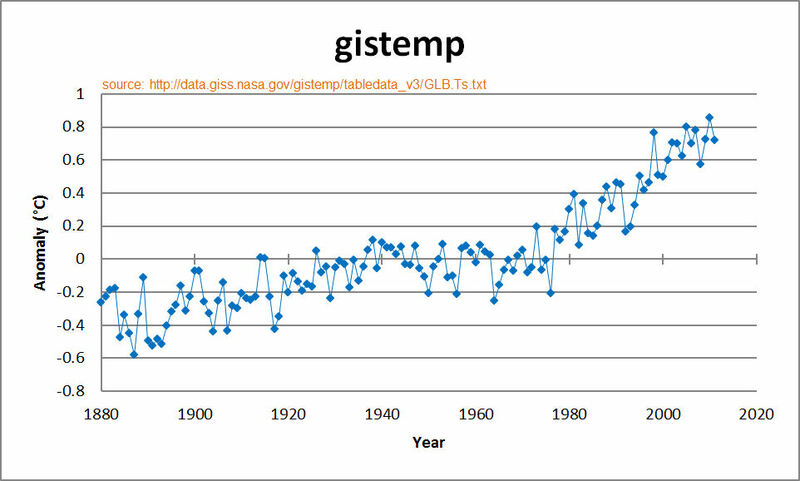 Now that I have gistemp as temperatures, I can generate the atmospheric limits based on my Excel model. 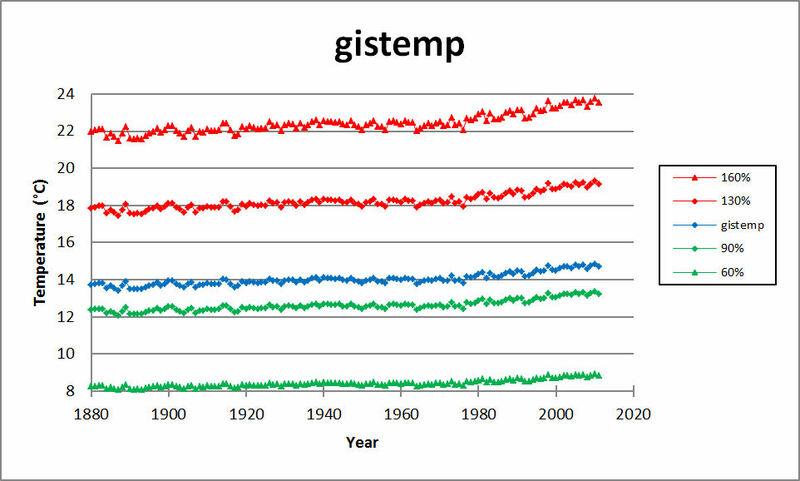 The graph in Figure 4 shows five curves: gistemp, 60% of gistemp, 90% of gistemp, 130% of gistemp, and 160% of gistemp. Since 1979 represents the reference year, all the curves will cross the zero axis in 1979 (but it doesn’t prevent them from crossing the zero axis at other times too). If you obtain trend line slopes of these curves and compare them; they match the original relationship between the temperature curves rather closely. Figure 6 shows this relationship with the equations of the linear trend lines displayed on the chart. The slope of the gistemp trend line is 0.0073. If we divide each of the other trend line slopes by this value, we get 0.6027, 0.8904, 1.3014, and 1.5890 respectively. This is very close to the values of 60%, 90%, 130% and 160% that we started with. The goal here is to overlay atmospheric anomalies on these temperature curves and see where they line up. If those atmospheric curves fall between the 130% and 160% temperature curves, then that will mean we’re looking at a GHE. However, if those atmospheric curves fall between the 60% and 90% temperature curves, then that will mean we’re looking at an albedo effect. Next we need the atmospheric anomalies. Figure 7 shows these anomalies. These anomaly curves have base year 1979. Two of the curves (UAH and RSS) begin in 1979. The other curves are referenced to year 1979; so all the curves must cross the zero axis in year 1979. This is why I picked year 1979 earlier. Comparing anomalies is like adding a list of figures. You have to align the decimal points, or in this case, you have to use the same reference year. These curves end in 2009, because that’s the limit with this reference. Finally here is my combined temperature anomaly graph shown in Figure 8 where we compare the earlier reference-temperatures with the Tropospheric temperatures. Several things are apparent. All the curves cross the zero axis in 1979–as they should; therefore the year 1979 doesn’t tell us anything. However, as we move away from 1979, the curves start showing a trend. Most are well below gistemp and some are even below the 60% lower limit curve. This basically indicates that the more recent trends are not due to GHE but are clearly due to albedo decreases. The temperatures prior to 1979 are not as clear as they seem to be more confused. Additionally, the very hot year in 1999 was probably due to extensive water vapor from a strong El Nino. I would have expected 1999 to clearly show a GHE; but it, too, is below the 130% limit temperature. It’s a possible demonstration of Hansen’s manipulation of gistemp. 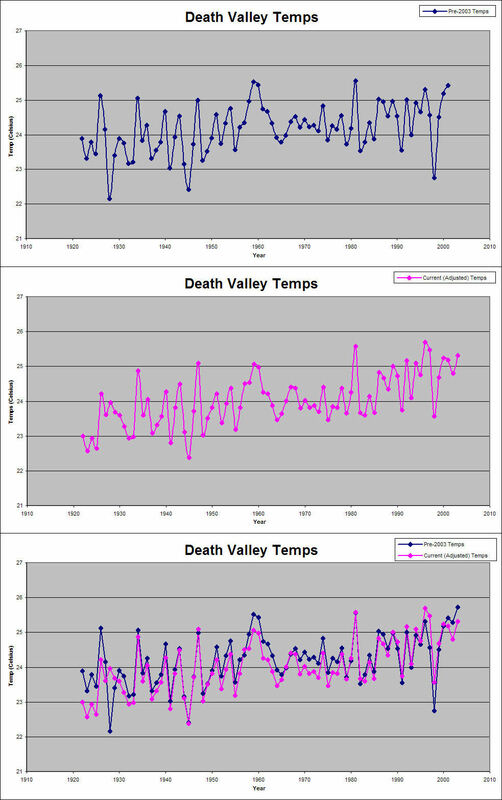 For example, my Death Valley graphs (Figure 9) show that the current curves are tilted more in favor of later warming and cooler earlier temperatures. 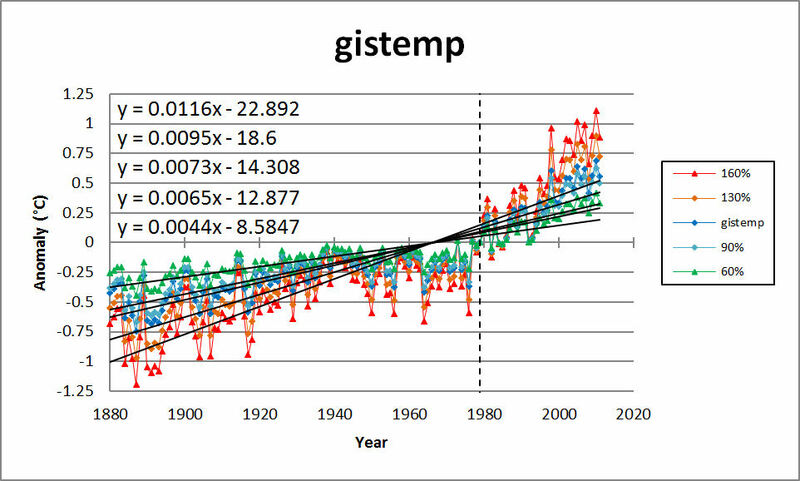 The combined anomaly curves in Figure 7 would occur if you tilt gistemp to show more warming in the present. The earlier temperatures are used as reference temperatures and are also adjusted downward. That may be why they show less albedo warming. 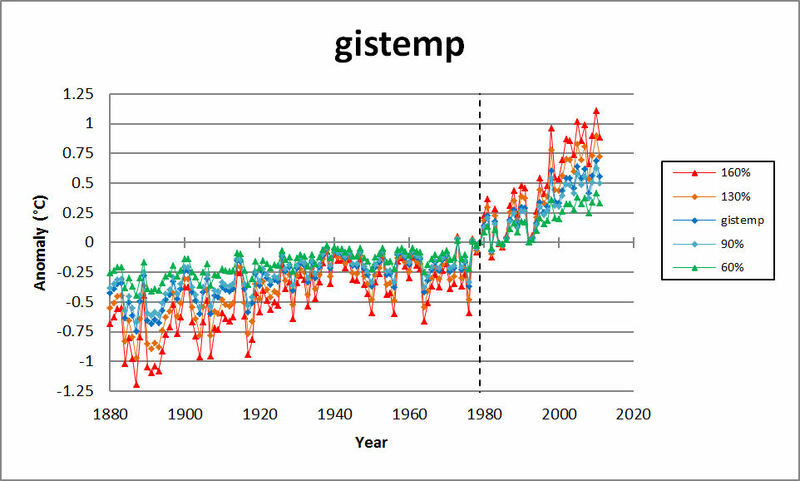 It’s also interesting to note, that by adjusting gistemp to show what Hansen thinks is a GHE, he’s actually decoupling gistemp from the atmospheric temperatures. He’s making it show that the GHE is less likely and an albedo decrease is more likely. It would be nice to see what an undoctored gistemp shows. About albedo….. I’ve seen some figures on clouds, but they haven’t met my satisfaction as to identifying what kind of clouds or quantifying them or their supposed effects. It stands to reason that a warmer world would have larger cloud cover. The surface ice, although we constantly hear screams about all of the melting ice, we see that it hasn’t moved that much, although the disparity is seasonal. That said, whatever losses have occurred, would have the greatest impact because of the angle of incidence. If we are seeing albedo, its just a feeling of mine, but I think it would be because of increases in the biosphere. We see trees where none used to exist. Where I live, for instance, Kansas was described as a vast wasteland by the early explorers. But, in the little corner I live in now has thick dark green canopies everywhere. But, that’s just a guess. I’ve about lost hope that we’ll ever see an untouched graph. Thanks James. I’ll post a more detailed reply shortly. I am thankful that I detected this web blog , just the right info that I was searching for! .